Allison A. Fuchs, DVM, is an ophthalmology specialty intern at BluePearl Veterinary Partners in Atlanta. Her clinical interests include all aspects of veterinary ophthalmic disease, particularly ophthalmic manifestations of systemic diseases. She received her veterinary degree from Oklahoma State University and then completed a rotating internship with BluePearl Veterinary Partners in Atlanta. Ellen B. Belknap, DVM, MS, DACVIM, DACVO, is the ophthalmologist with BluePearl Veterinary Partners in Lawrenceville, Georgia. Dr. Belknap completed her veterinary degree at the University of Georgia and then a residency in large animal internal medicine at Michigan State University. She taught at Colorado State University and Auburn University before completing a residency in ophthalmology at Auburn University and Ohio State University. Dr. Belknap practiced in Akron, Ohio, before joining BluePearl in 2016. The overall prognosis for life in most primary intraocular neoplasias is good. In companion animals, intraocular tumors are relatively uncommon, but those that do occur can be primary, metastatic, or locally invasive. Tumors can appear as discrete masses, diffuse changes, or even after uveitis. Learning to recognize the presence of a mass and differentiate it from an infectious or benign disease process can help you determine when to recommend medical treatment, surgery, or referral to an ophthalmologist. Here we review the types of intraocular neoplasia most frequently seen in our canine and feline patients, the differentiating features helpful for diagnosis, prognosis, and treatment guidelines. We discuss each species separately. FIGURE 1. (A) Uveal cyst. 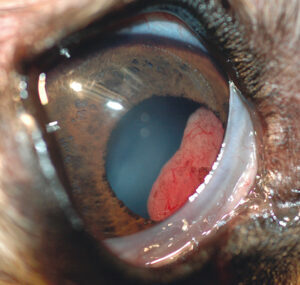 (B) Uveal melanocytic tumor in the dorsal iris of a dog. Note that both are darkly pigmented, but the cyst was freely movable during examination and easily transilluminated. FIGURE 2. Red, vascularized mass originating posterior to the iris in the pupil of a dog. Histopathologic diagnosis was adenoma of the ciliary body. The second most common location for primary intraocular tumors in dogs is the ciliary body. Tumors in this location are generally adenomas or adenocarcinomas. Rarely, they can be medulloepitheliomas (a type of neoplasia from undifferentiated epithelial cell types that can occur in younger dogs). Ciliary body adenomas and adenocarcinomas are usually found in older dogs and can sometimes be seen as a tan/pink mass extending through the pupil (FIGURE 2). Labrador and golden retrievers may be predisposed to epithelial ciliary body tumors.4 These tumors may also invade the iris, cause anterior displacement of the iris, or result in secondary uveitis and glaucoma. Often these masses are not diagnosed until they have caused secondary complications. Secondary, metastatic neoplasia in the eye can result from hematogenous spread and is most commonly seen with lymphoma or local invasion from adjacent structures. One study reported that 14.8% of all intraocular tumors in dogs were metastatic disease and that 6.3% of metastases were from lymphoma.6 Reportedly, a wide variety of tumors metastasize to the eye: histiocytic sarcoma, mammary adenocarcinoma, hemangiosarcoma, malignant melanoma, and osteosarcoma.5 Because the metastatic potential of most primary intraocular neoplasms is low, the presence of disseminated disease generally indicates that the intraocular tumor is metastatic. Ocular manifestations may be the first signs noticed but further workup can reveal a primary tumor elsewhere. Primary intraocular neoplasms are generally unilateral, whereas bilateral disease suggests metastatic disease. Bilateral ocular neoplasia should prompt a complete workup to evaluate for primary neoplasia elsewhere in the body, which can often be life-threatening. For any patient with unexplained hyphema, the differential diagnosis should include neoplasia, and ocular ultrasonography may help identify the presence of a mass. Sometimes diagnosis can be based on histopathologic appearance of enucleated globes. Ciliary body tumors often go undiagnosed until they have caused significant uveitis and secondary glaucoma. FIGURE 3. Ultrasonography image of a globe from a patient with hyphema, partial anterior lens luxation, and secondary glaucoma; image obtained by use of B-mode ultrasonography. 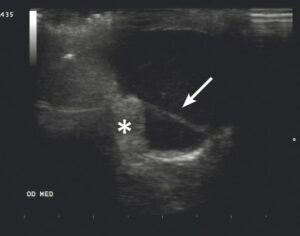 Ultrasonography revealed retinal detachment (arrow) and possible ciliary body mass (asterisk). Because of secondary complications, this eye was enucleated. Histopathologic examination revealed retinal detachment and a blood clot in the posterior chamber. Ocular ultrasonography is a valuable, noninvasive imaging tool and can generally be performed by an ophthalmologist or radiologist to help make a diagnosis and further recommendations. It is particularly useful for patients with opacities in the clear ocular media that prevent direct examination, and it can generally be performed without sedation. Even for patients in which the mass can be directly observed, ultrasonography can help you determine the origin of the mass as well as enable its measurement. Most practitioners use B-mode ultrasonography for image capture, although A-mode can be useful for taking measurements and is used in human ophthalmology for evaluating the internal structure of some masses.10 The accuracy of ultrasonography for identification of intraocular masses is good, but occasionally intraocular blood clots can mimic masses10 (FIGURE 3). For avoiding misdiagnosis of blood clots as tumors, standardized imaging protocols performed by an experienced operator can be helpful; for some animals, serial ultrasonography can also be beneficial. For obtaining images of the best possible quality, appropriately sized probes for ocular imaging are needed. For some patients, computed tomography or magnetic resonance imaging is helpful. These modalities can be used to detect bony involvement, extra-ocular soft tissue extension, or local invasion from an intraocular tumor. They can also provide information for surgical planning and help determine whether further treatment with chemotherapy or radiation might be needed. 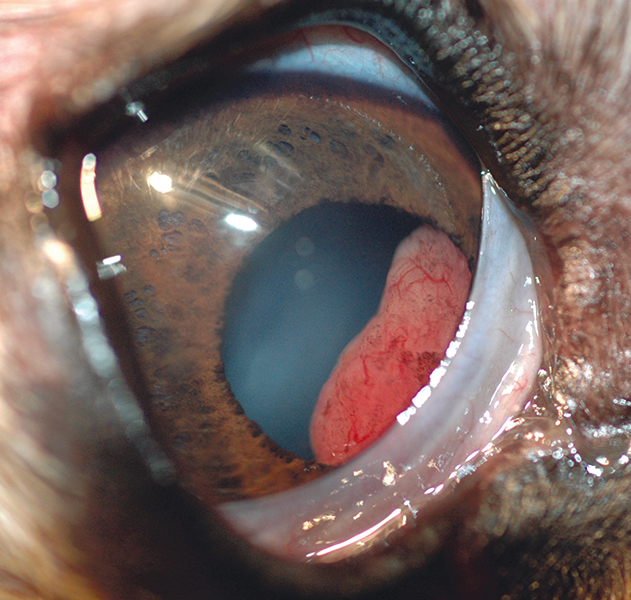 Treatment of any intraocular neoplasia in the dog is based on multiple factors, including the suspected tumor type, evidence of metastatic disease, secondary complications, and overall patient health. Enucleation is indicated when the patient has intractable secondary uveitis, glaucoma, or ocular discomfort unresponsive to medications or when the goal is to obtain a diagnosis. Patients with severe uveitis obscuring a definitive diagnosis may warrant aggressive medical treatment with topical and systemic anti-inflammatories before definitive therapy. Treatment can help clear anterior chamber hemorrhage and inflammation to enable direct examination of the eye, which may reveal an obvious mass and prompt enucleation. Even in the absence of an obvious mass, discomfort and secondary glaucoma may prompt enucleation and submission of the globe for histopathology. For tumors that have extended outside the globe, exenteration (removal of the globe and surrounding orbital tissues) may be recommended. Any enucleated eyes or locally excised tumors should be submitted for histopathology to determine the type of neoplasm and whether any further treatment (e.g., chemotherapy or radiation) is recommended. Treatment by enucleation is controversial for the many dogs that have melanocytic uveal tumors in an eye that is still functional (i.e., can see) and that have no evidence of inflammation and glaucoma. Some practitioners elect to monitor apparent uveal melanomas because of their slow progression and low risk for metastasis. Some melanocytic tumors are amenable to laser photocoagulation.5 Laser photocoagulation can be performed with endolaser, transscleral, or transcorneal diode or Nd:YAG laser and is best suited to focal tumors with no extension into the iridocorneal angle. To preserve vision in dogs with no secondary complications, local excision of a mass with iridectomy or iridocyclectomy procedures has been described.11 Clients interested in vision-sparing surgical or laser treatment options for their pet should be referred to an ophthalmologist for further evaluation. FIGURE 4. (A) Gross image of a large, pink, vascular mass and associated fibrin in the anterior chamber of a cat. (B) B-mode ultrasonography image from the same patient, demonstrating an extensive mass in the anterior chamber (arrow) as well as invading the posterior chamber (asterisk). Histopathologic diagnosis after enucleation was undifferentiated sarcoma. Other primary intraocular neoplasms are uncommon in cats, but as in dogs, intraocular disease can be metastatic. Because of the high rate of malignancy of posttraumatic ocular sarcomas in cats, any blind eye that resulted from trauma should be considered for early enucleation. FIGURE 5. Photograph of the iris of a cat, showing flat, pigmented nevi (iris melanosis), which have not progressed to melanoma. 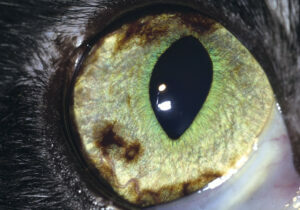 Feline diffuse iris melanosis begins as benign, flat, hyperpigmented nevi on the iris. Over months to years, diffuse melanosis may progress to malignancy and should be monitored closely for changes. Photographs of the affected eye can help you evaluate these eyes over time. Melanoma lesions are distinguished by the spread of pigment, thickening of the iris, or irregular iris surface (FIGURE 5). Eventually, these changes can invade the ciliary body, iridocorneal angle, and sclera, and may result in secondary glaucoma.4,19-21 Rates of metastasis range from 55% to 66% after the lesions have become malignant, and the overall prognosis is poorer if the tumor has invaded the ciliary body or sclera at the time of enucleation.1,3,7,12 The prognosis is also worse for cats that have secondary glaucoma. With regard to metastatic disease, lymphoma is the most common offender and can appear as anterior uveitis, an intraocular mass, or both. As previously discussed, bilateral ocular disease is suggestive of metastatic neoplasia. Cats with signs of metastatic intraocular neoplasia should also be tested for FeLV and FIV, both of which can predispose the cat to systemic neoplasia and thus intraocular metastasis. Treatment is systemic therapy, such as for lymphoma, as well as topical management of uveitis and secondary glaucoma, if present. Intraocular metastatic neoplasia can be difficult to distinguish from other causes of feline uveitis (e.g., feline infectious peritonitis, toxoplasmosis, or other infectious causes). Signalment and other systemic signs can help you determine the underlying cause, but any cat with profound bilateral uveitis should be evaluated for evidence of neoplasia in addition to infectious diseases. Enucleation is the treatment of choice for feline diffuse iris melanoma; however, for many patients, it is difficult to decide when to enucleate because of the slow disease progression as well as reluctance to remove a comfortable, visual eye. Close monitoring of these patients over time is imperative; look for significant changes of the pigmented areas, which may indicate the need for surgical intervention. Alternative techniques (e.g., diode laser ablation or sector iridectomy) have not been widely used. They would probably be appropriate only for cats with small, focal lesions and are not guaranteed to prevent progression. Because of the high rate of malignancy of posttraumatic ocular sarcomas in cats, any blind eye that resulted from trauma should be considered for early enucleation. After a sarcoma has developed, exenteration is the recommended treatment, along with staging to evaluate for involvement of the regional lymph nodes and for distant metastasis. Intraocular neoplasia is uncommon in companion animals but should be considered in the differential diagnosis for patients with uveitis and glaucoma as well as for those with discrete masses. The most common primary intraocular tumor of both dogs and cats is uveal melanoma, although epithelial tumors and feline intraocular sarcomas are possible. Animals with bilateral disease should be evaluated for evidence of primary neoplasia elsewhere with metastatic spread to the eyes. For all species, knowing the most common tumor types and their appearance can help you determine the prognosis. Although the sequelae of tumor growth often necessitate enucleation of the affected eye, most primary intraocular neoplasia has low metastatic potential, so the overall prognosis for life is good. A good first-line tool for identifying intraocular masses is ultrasonography. When neoplasia is suspected, consider referring the patient to a veterinary ophthalmologist. For some patients, vision-sparing surgical procedures are available. Dubielzig RR. Ocular neoplasia in small animals. Vet Clin North Am Small Anim Pract 1990;20(3):837-848. Petersen-Jones SM, Forcier J, Mentzer AL. Ocular melanosis in the Cairn terrier: clinical description and investigation of mode of inheritance. Vet Ophthalmol 2007;10(suppl 1):63-69. Hendrix, DVH. Diseases and surgery of the canine anterior uvea. In: Gelatt KN, Gilger BC, Kern TJ, eds. Veterinary Ophthalmology: Two Volume Set. 5th ed. Ames, Iowa: Wiley-Blackwell; 2007:1146-1198. Dubielzig RR, Steinberg H, Garvin H, et al. Iridociliary epithelial tumors in 100 dogs and 17 cats: a morphological study. Vet Ophthalmol 1998;1(4):223-231. Miller PE, Dubielzig RR. Ocular tumors. In: Vail D, ed. Withrow and MacEwen’s Small Animal Clinical Oncology. 5th ed. St Louis, Missouri: Elsevier; 2013:597-607. Labelle AL, Labelle P. Canine ocular neoplasia: a review. Vet Ophthalmol. 2013;16(s1):3-14. Wang AL, Kern T. Melanocytic ophthalmic neoplasms of the domestic veterinary species: a review. Top Companion Anim Med 2015;30(4):148-157. Wilcock BP, Peiffer RL. Morphology and behavior of primary ocular melanomas in 91 dogs. Vet Pathol 1986;23(4):418-424. Diters RW, Dubielzig RR, Aguirre GD, Acland GM. Primary ocular melanoma in dogs. Vet Pathol 1983;20(4):379-395. Gallhoefer NS, Bentley E, Ruetten M, et al. Comparison of ultrasonography and histologic examination for identification of ocular diseases of animals: 113 cases (2000–2010). JAVMA 2013;243(3):376-388. Cook CS, Wilkie DA. Treatment of presumed iris melanoma in dogs by diode laser photocoagulation: 23 cases. Vet Ophthalmol 1999;2(4):217-225. Blacklock BT, Grundon RA, Meehan M, et al. Uveal cysts in domestic cats: a retrospective evaluation of thirty-six cases. Vet Ophthalmol 2016;19:56-60. Dubielzig RR, Everitt J, Shadduck JA, Albert DM. Clinical and morphologic features of post-traumatic ocular sarcomas in cats. Vet Pathol 1990;27(1):62-65. Peiffer RL, Monticello T, Bouldin TW. Primary ocular sarcomas in the cat. J Small Anim Pract 1988;29(2):105-116. Duke FD, Strong TD, Bentley E, Dubielzig RR. Feline ocular tumors following ciliary body ablation with intravitreal gentamicin. Vet Ophthalmol 2013;16(suppl 1):188-190. Beckwith-Cohen B, Teixeira LBC, Dubielzig RR. Presumed primary intraocular chondrosarcoma in cats. J Vet Diagnostic Investig 2014;26(5):664-668. Zeiss CJ, Johnson EM, Dubielzig RR. Feline intraocular tumors may arise from transformation of lens epithelium. Vet Pathol 2003;40(4):355-362. Sandmeyer LS, Leis ML, Bauer BS. Diagnostic ophthalmology. Can Vet J. 2017;59(7):757-758. Wiggans KT, Reilly CM, Kass PH, Maggs DJ. Histologic and immunohistochemical predictors of clinical behavior for feline diffuse iris melanoma. Vet Ophthalmol 2016;19:44-55. Evans D, Peiffer RL. Morphology and prognostic indicators of anterior uveal melanomas in cats. Vet Comp Ophthalmology 1991;1:25.